Spain’s national Socialist party (PSOE) responded Wednesday to a majority vote in Catalonia’s parliament symbolically proclaiming the right of any of three jailed pro-independence leaders to be elected regional president, saying the region’s pro-independence parties “do not understand the rule of law” and that the PSOE-affiliated Partit dels Socialistes de Catalunya (PSC–PSOE) will not join any coalition government in Catalonia led by pro-independence Esquerra Republicana de Catalunya (ERC). At the same session of Catalonia’s Parlament Wednesday, the pro-independence majority voted down a PSC motion to form a transversal all-party government, as well as a proposal from the Podemos-backed Catalunya en Comú coalition for a government comprised of independent figures to break the current partisan deadlock over electing a new president of Catalonia. The pro-independence Junts per Catalunya (JxCAT) list said it remains firmly committed to the presidential candidacy of the region’s former ex-president, Carles Puigdemont, who was a fugitive from Spanish justice until his arrest on Sunday in Germany, where he currently awaits an extradition hearing. Although the parliamentary majority Wednesday symbolically endorsed Puigdemont’s “right” to be re-elected, the ERC is said to privately favor putting forward a candidate who does face any legal proceedings over Catalonia’s unconstitutional 1st October independence referendum and subsequent declaration of independence from Spain. The PSC-PSOE previously governed Catalonia in coalition with the ERC from 2003-2010, but distanced itself from the ERC when the regional party swung sharply in favor of independence after signing a 2012 governing pact with the centre-right Convergència Democràtica (CDC) party of then-President Artur Mas, who stepped aside in 2015 in favor of Carles Puigdemont. 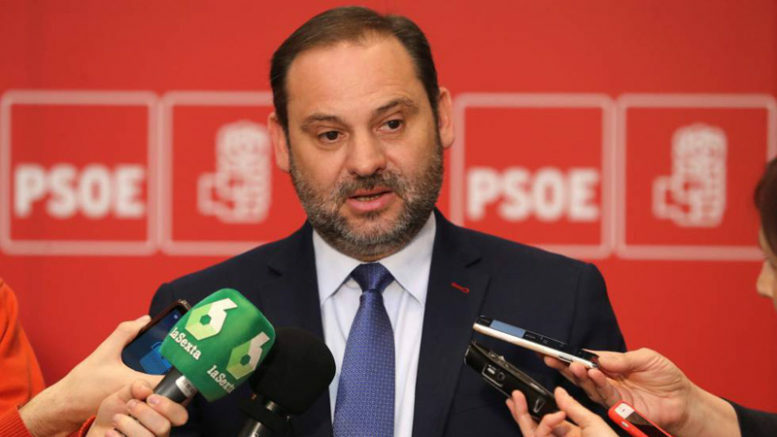 Ábalos said proof that the ERC had not moved away from its pro-independence position was a speech given earlier in the week by regional ERC deputy Roger Torrent, president of the executive committee of Parlament, which the PSOE spokesman said was “delirious” and carried “authoritarian” overtones with its rejection of the Spanish legal system’s jurisdiction over Catalonia’s politicians or political system. At the same time, Ábalos rejected the possibility of supporting a transversal non-partisan government of independent figures as mere democratic posturing on the part of the Comúns. The problem for the PSOE in forming any coalition that would include Catalunya en Comú, he said, is that “the Comuns always side with the independendistas”. Ábalos cited as evidence of the Comúns’ real position their break with the Socialists in the Barcelona municipal government over the PSOE’s support of direct rule of Catalonia, as well as the the Podemos-backed proposal in Parlament Wednesday of a resolution approved with support of the pro-independence majority that calls for all Catalan pro-independence leaders jailed by Supreme Court Judge Pablo Llarena to be freed.